Microsoft Office Excel has built-in tools based on tabular data to create charts of different types. A graph that can show a direct line here is also related to the diagrams. In Excel and the ability to fill the table with data, calculated according to the formulae given by the user, so the task of building a straight with the use of this program can be attributed to the discharge is not very complicated. The table editor Microsoft Office Excel 2007 or 2010. Launch Excel and complete the two columns created by default, the worksheet with an empty table. The first column should contain a list of points along the x-axis, which should be present on the chart with a straight line. Place in the top cell (A1) in this column the minimum value along the X-axis, for example, -15. The second line of the column, type an equal sign, then click the mouse pointer to the previous cell, type a plus sign and type the number corresponding to the amount of the increment for each successive point on the x-axis. For example, to between points along the X-axis is the distance in 2.5 points, the contents of this cell (A2) should be: =A1+2,5. To finish entering the formula, press Enter. 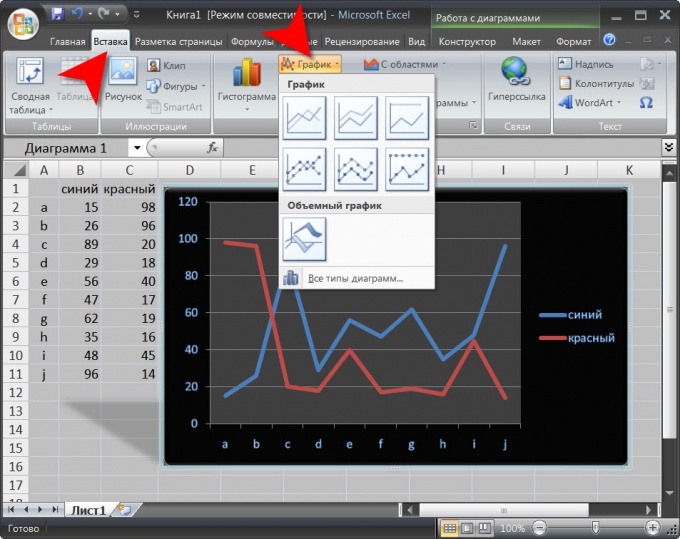 Move the mouse pointer to the bottom right corner is filled in cells of a table, and when the pointer transformirovalsya in the black plus sign and drag the cell down to the last row of data column. For example, if you want to direct was built on 15 points, dragged the selection to the cell A15. In the first row of the second column (B1) type the algorithm for calculating the points of a straight line. For example, if they must be calculated by the formula y=3x-4, the contents of the cell should be: =3*A1-4. After you press Enter and drag this cell to the full height of the table described in the previous step. Select both filled column and then click the "Insert" menu in Excel. In the group of commands Charts open the drop-down list of "Point" and select the most suitable type of chart. Immediately after that, the table editor will calculate the point and place chart on the same sheet of paper. Using the three tabs combined with the title "Working with diagrams", give the desired look created by the graphics. These tabs application adds in a menu after creating a new chart, and later you can call them with the line chart selected by mouse click. To build chart you must have at least some knowledge, start to act immediately by several methods. Tables Excel is a powerful tool with which you can process huge amounts of data to make a variety of computing, display them in tables, and the process of visualization becomes easy and convenient. The diagram is one way of data representation. Consider two versions - 2003 and 2010, and versions 2007 charting is similar to the 2010 version, so consider this version of the program will not. So, how to make a chart version 2003? 1. Run the program. In a new workbook enter the data table. 2. Allocated to the prepared table. 3. Go to the menu “Insert”, select “Chart”. 4. In the window select the type of graph that you like, such as a conventional histogram. 6. You will see a window where you need to choose the source for the build. Initially, the selected source data table, so they will be recorded automatically in the field “Range”. 8. Now the chart setup. Here you can define the title and name the axes, configurable legend, set the caption to data. Nothing complicated, in just understand. 9. In the final window, choose the place where you insert the chart. 1. Run the program, fill the table with the relevant data. 3. Again the group Insert “Insert”, then bar Charts. 4. Select a chart type. 5. Once you have selected the chart type, the chart is automatically inserted into the worksheet where the data table. 6. All settings for the chart can be done if you click the graph, right-click and go to Format Chart Area. To graph it is also possible for a different program standard Microsoft Office package, text without leaving the word program. If you made a table there, go to “Insert” on the top bar and choose the icon with the graph. Clicking on it will call up a window where again, you must select the most suitable for your chart and click “OK”. After that, you will come up a window where you need to draw a table with data, and a picture of the chart will already be inserted in the vordovsky document. As soon as you enter the data in the table will change the figures inserted in the graph document. Labels to the chart, you can also sign in table and necessary settings are made, if you click on the picture right mouse button. In the drop-down menu will appear a lot of interesting settings, including changing the chart type, changing the labels, and the like. Thus diagrams in a text document. As you can see, there are no difficulties and the result is obvious, you can easily cope with this task independently. Even very competent and informative text, require illustrations. If it has lots of different comparative data, the tables, the obvious desire to see them not only in the form of dry figures, but also in the form of graphs, charts. Them more clearly visible what is set out in tabular form. The more that you can do it without the help of various graphic editors directly in the program where you prepare tables in Excel. First, make the desired table. Assume that the graph has two axes – horizontal (X-axis) and vertical (Y-axis). Accordingly, in the table that are columns and rows. The name of the columns and rows in the future will be the name of the axes. An example of a table. After the table is built, select it and click the "chart Wizard". By default, it is located on the standard toolbar next to the help icon. Window opens the "chart Wizard-step 1 of 4: chart type". In this window, select the graphics option that suits you best. To learn how your data will look in a particular embodiment, there is a button "View results". Click on it and hold some time on place "the View" will be displayed graph for your table. If the standard chart was not needed, look at the tab "Custom". Having defined the type of chart click the Next button - go to step 2. In the upper part of the window a sample of your future schedule, then the range is selected area. If you forgot to select a table first, or change the allocation – change here. Also, changing the pointer "Series in rows/columns, you can change the data in X and Y. the Result is visible immediately, if you don't like it, return it. In step 3 you can set all the necessary parameters: designation of the axes, the color and thickness of lines, fills, markers, font, etc. including here, in the tab "Legend", create it (by putting a tick in the appropriate box), specify the position relative to the chart. The legend needed in order to see what data is on the chart that mean. You can also attach to the schedule table data. At the final step, select how you want to see a created graph, chart on the same worksheet where the table or the other (can select any existing worksheet in the workbook or create a new one). After selecting, press "Finish". Your schedule will look like. If for some reason you are not satisfied with the result, it's easy to fix. Fix the schedule you can right in it (click the right mouse button's context menu or in the main menu "Chart". Subparagraphs of this tab contain all four of the above-mentioned step. Now you know that by changing the data in the main table and immediately get the updated schedule. Benefits on the face – no need to make a new graph, update it at least every hour. It is on this principle are formed the various daily, monthly, etc. reports vividly and clearly. To illustrate a variety of statistical and scientific data very useful chart. Spreadsheet editor of Microsoft Excel offers a large number of standard charts and allows you to create complex combinations of ready-made templates. - press the F11 key. Excel will create a chart on a separate sheet using the default settings. Since the default chart is built, go to menu "Graph" main menu and expand the "chart Type" to choose the line chart. Select list Type" item "Schedule". In the chart Wizard 2 tabs: "Standard" and "Nonstandard". Among custom charts Excel offers combined, for example, a graph histogramme or chart with two value axes. Click "Next". In the tab "Range" specify the range of values used to build the graph. By default, the program considers the entire table. Under "Series in" select which value will be indicated on the x-axis: columns or rows. To continue, click "Next". To move to the next step click "Next". Specify that will host the chart: on a separate sheet or on the current working. If you want to change the thickness and color of lines on the chart, highlight the data series and in the main menu open item "Format". Click "Selected range". In the "Format data series", switching to the appropriate tab, change the appearance of a chart line and marker. You can choose the color and thickness of lines and the geometric shape of the marker; add a legend, and data labels; construct projection lines on a coordinate axis, etc. In Microsoft Excel 2013, you can quickly show a chart like the one above, turning your chart in combination. Click the diagram you want converted into a combination to open the tab charts. Click design > Change chart type. When you open the chart wizard, Microsoft Excel chooses the default chart type "Histogram". If you chose a different type on the basic tab, click Preview results (and holding it), you can see a Combination chart that combines a bar graph with the graph. 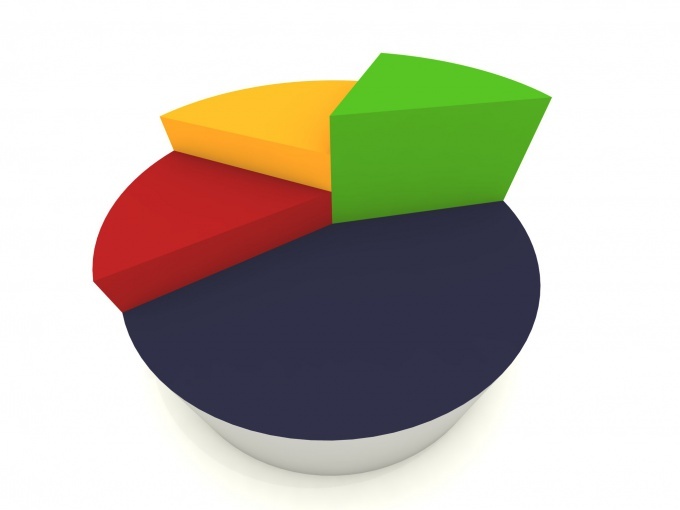 If on the same graph you want to display different categories of information, use a combination chart. In the table editor Microsoft Office Excel not allocated in a separate set of functions for creating and editing graphics. For visual representation of tabular data here is a group of commands Charts, and several types of graphs included in it as special cases of graphs. However, this does not affect the breadth of opportunities that are provided by this table editor for data presentation in the form of graphs. 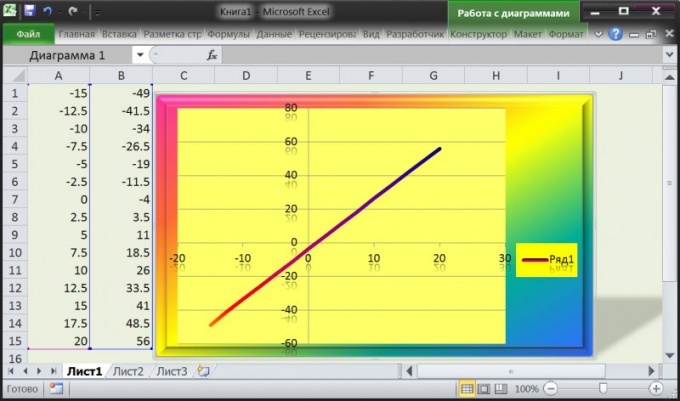 Start Microsoft Excel and load the spreadsheet containing the data to plot. 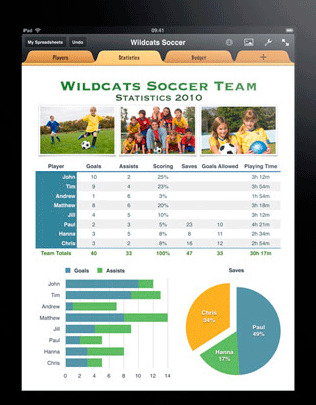 Or create a new document and fill it with necessary data. Select the spreadsheet cell range upon which you want to graph. In addition to the data itself, you can highlight the column with the row that include the title. In this case, the values from the cells of the left column will be marked dividing the horizontal axis (X-axis) of the graph, and the values across the top row in the legend will be signed the corresponding line graph. 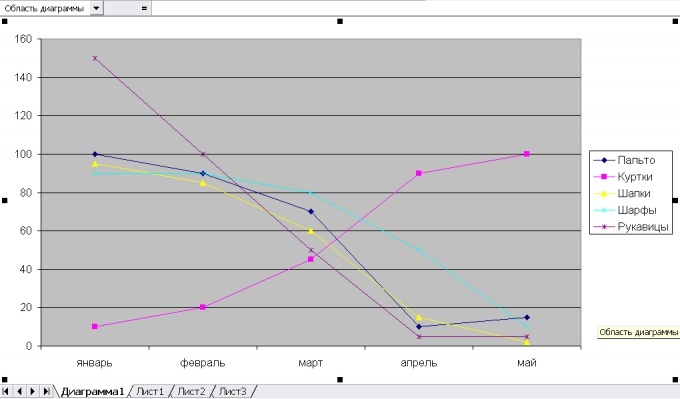 It is recommended that the number of columns of data, and therefore the number of lines simultaneously displayed on the chart, it was not more than seven. Select the menu table editor the "Insert" tab and click "Chart", placed in a group of commands "Diagram". In the popup list of seven design options and choose the most appropriate. The table editor will be based on your chosen layout graph constructed from the data in the selected cells of the table. They will use the installation default skin. To change Microsoft Excel will add a tabs menu three "Designer", "Format" and "Layout". Replace the scheme used by the table editor when you create graphics if needed. On the "Designer" is a drop-down list of "chart Styles" and "chart Layouts". In addition to selecting the preset options, you can based on them to create your own version of the design graphics using posted on the tab "Format" and "Layout" tools. Save the edited version of the design graphics if you intend to use it in the future. On the design tab, use the button placed in the group of commands Type". In the group of commands "Data" there is an icon that swaps the axes, that is, transporoute data. Another button in this group of commands designed to change a range of cells, based on which the graph was built.